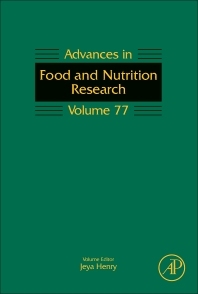 Advances in Food and Nutrition Research recognizes the integral relationship between the food and nutritional sciences, bringing together outstanding and comprehensive reviews that highlight this relationship. The book contains contributions that detail scientific developments in the broad areas of food science and nutrition, providing those in academia and industry with the latest information on emerging research in these constantly evolving sciences. Food scientists in academia and industry and professional nutritionists and dietitians.